This species is accepted, and its native range is Medit. 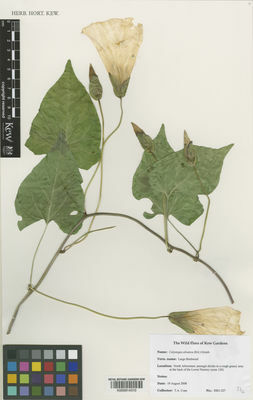 to N. Iran, S. China, S. Canada to Central & E. U.S.A.
Convolvulus sylvestris Waldst. & Kit. Austin, D. F. (2006). Noteworthy distributions and additions in southwestern Convolvulaceae Canotia 2: 79-106. Arizona State University, School of Life Sciences. Brummitt, R.K. (1980). Further new names in the genus Calystegia (Convolvulaceae) Kew Bulletin 35: 327-334.